I really like that coat and the plaid heels! In fact, they would look great together! Such a pretty white coat, I love the gold button detail! Awesome picks all around! skirt is amazing... wanna follow each other? just tell me if u follow me, then i'll follow u back immediatley. the white coat is gorgeous - and you can never have too many coats, right? That coat is gorgeous! And I'm lusting after that J. Crew skirt... 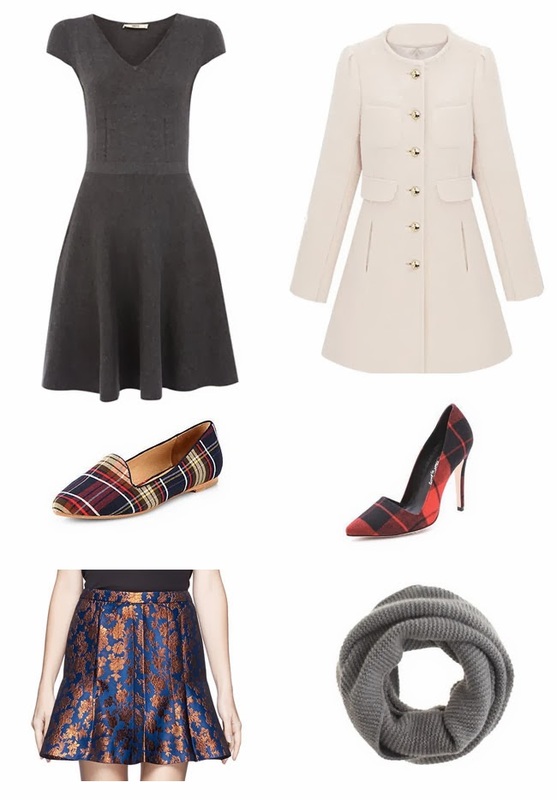 I think it would be so cute to wear to some holiday parties :) Great picks! That white coat is dreamy! I have a white coat I got years ago and LOVE but it's gotten kinda dirty :(. Such a bummer. Oh my gosh, tartan pumps. I must have! Those alice & olivia tartan heels are amazing.